Please drop off PJs in the Children’s’ Room. The Nevins Library has teamed up with the Boston Bruins to participate in their annual pajama drive to benefit DCF Kids and Cradles to Crayons. The PJ Drive’s goal is to collect 12,000 pairs of new pajamas for children and teens in need. And the Nevins Library’s Children’s Room’s Goal is to collect a whopping 200 pairs this year, so we need everyone’s help!! 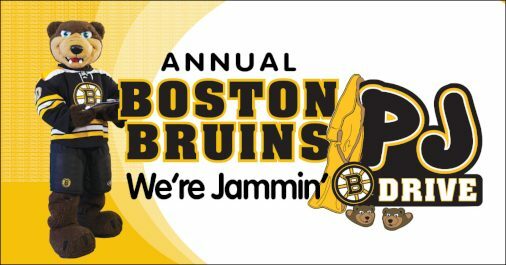 Something that’s even cooler, is that while you’re helping children, participating libraries will compete with other organizations for special Bruins prizes including a street hockey clinic with Bruins Mascot Blades and autographed Bruins items too!! The Boston Bruins PJ Drive runs from February 1 through March 15, 2019. The library will be collecting new pairs of pajamas for babies, children, and teens. Please drop off PJs in the Children’s Room. And please remember, they need to be new!